Current dictionary entries have a fairly simple layout - the word, part of speech, definition, and notes. It's rudimentary, but works for what it is. As our understanding and perspective of the language grow, the dictionary itself will need some updating. Here's a sample for what I envision an updated dictionary entry could look like. The goal here is to develop dictionary entries beyond one or two-word translations, provide sources and examples, and delve deeper into the words than what word notes can currently do. Expanded Definition - a fuller definition listing all the different senses, parts of speech, etc. This layout incorporates the new parts of speech, which I've been thinking about for a long time but haven't been able to implement because of the old layout. 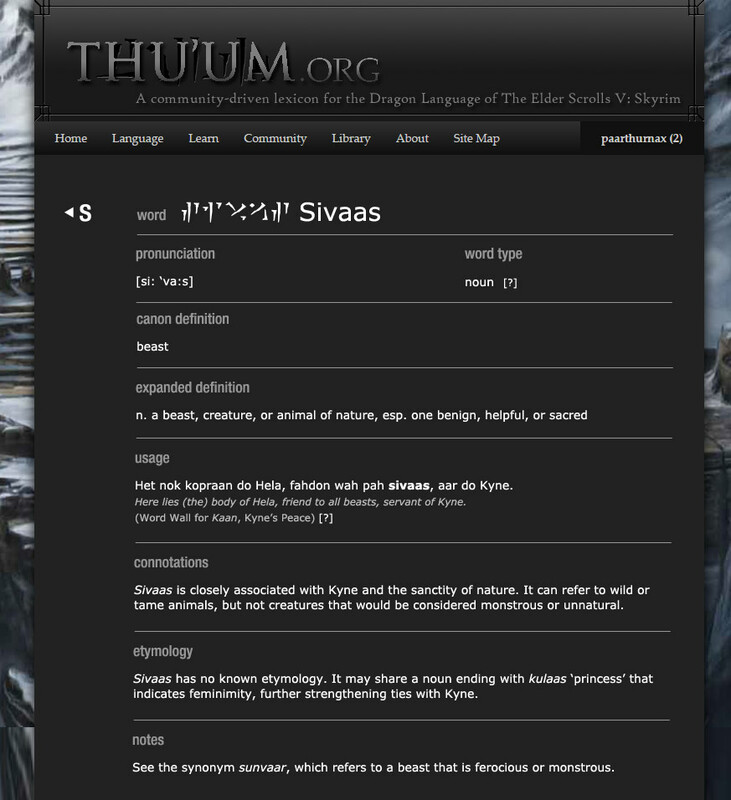 It also provides much more information than the current dictionary entries. Altogether, these changes will help people understand the language better and lend the site much more credibility. If this were to be implemented, I would plan to do it for canon words only. The number of non-canon words is far too vast for something like this to be done for the whole dictionary. Non-canon words would continue to use the old layout. It's unfortunate in a way, but this level of detail would be a significant step forward for the language, and in my opinion it'd be more unfortunate to let the non-canon hold it back (as it is wont to do). My thoughts on non-canon go deeper than that but that's perhaps a discussion for another day. As always, let me know your thoughts and feedback. I'm for a new look, espicially if it aids the learning proccess! Items like Expanded definition and Connotations would also help newer members who aren't sure when to use word a or word b. Although possibly a large transition, I believe that this would be completely worth it in the long run. Here's a link to a folder on Google Drive containing the dictionary format template and an example dictionary entry, as well as a spreadsheet with expanded definitions that Aaliizah and I wrote a while back. Send me your Google account emails and I will set up a dictionary document where we can begin to add definitions. I've begun rewriting dictionary entries here. If you're interested in helping out, message me your Google Drive account email and I will set up a letter for you to work on. Copy and paste the dictionary template and do your best to follow the style I use (mostly incomplete sentences, contrary to what your English teacher might tell you). Search the PrimaGames.com list for the official definition. If not there, check the Dialogue File. Grab the expanded definition, if any, from this sheet. Otherwise usually the same as the official definition unless you can think of any close synonyms or specifics to note. Search the word on UESP to find its usage in books and Word Walls. If it's a short word, you can try ctrl+F on the Word Wall page and look for the English translation instead. Search the Dialogue File for usage. If it's a short word try adding a space before or after the keyword. Examine its usage for special connotations. A word's etymology can also give hints about its connotations. For example, midrot 'loyalty' is a compound meaning 'loyal-word', so deals more specifically with loyalty given by an oath, vow, or pact. This section is to distinguish similar words and clear up any confusion that could be had by just looking at the official definition alone. Check the existing dictionary entry for any root word or related words and list them in the "See Also" section. If you don't have the Prima Games guide, just put (POGGLE?) in your citations and I'll go through and check to see if it's there.